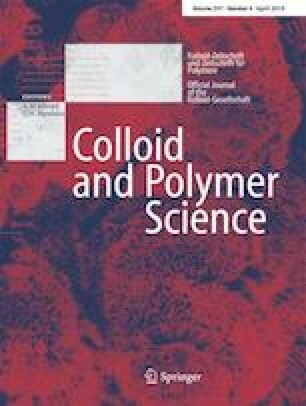 Poly(N,N-dimethylacrylamide)-clay nanocomposite gels (NC gels) with patterned network-chain density were prepared by photoinitiated radical polymerization with photomasks. The exposed region of the obtained gels showed a higher swelling ratio and lower elastic modulus than the masked region, although these regions had the same weight composition. A stripe-patterned gel prepared using a photomask with many slits of several hundred micrometers wide exhibited mechanical anisotropy: the elastic modulus in the direction parallel to the slits was higher than that in the perpendicular direction. A part of this work was conducted in Tsukuba University, supported by Nanotechnology Platform Program of Ministry of Education, Culture, Sports, Science and Technology (MEXT), Japan. The author is grateful to Professor T. Dobashi for useful advice and to Mr. K. Ishizaka, Mr. S. Yasuraoka, and Ms. M. Yamada for their contribution to the experiments. This study was partly funded by the Ministry of Education, Culture, Sports, Science and Technology (MEXT) and by Japan Society for the Promotion of Science (JSPS KAKENHI) (Grants-in-Aid for Scientific Research) Grant Number 16H04031. The author declares that he has no conflict of interest.